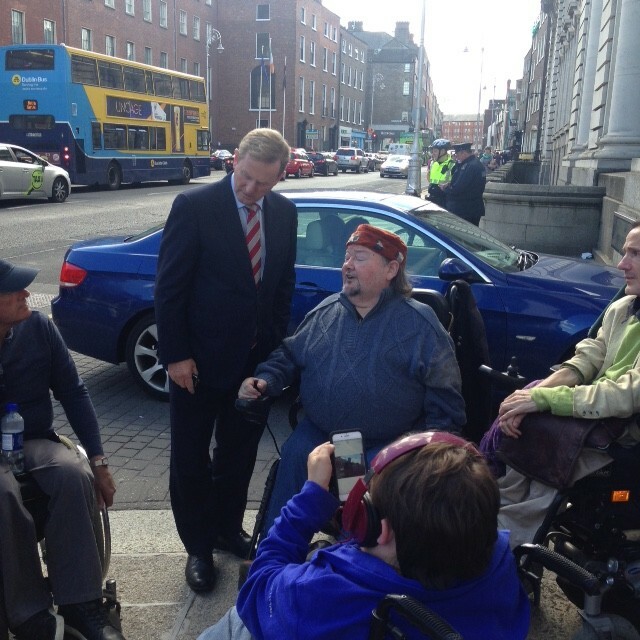 Disability protesters have told An Taoiseach that a Government decision to provide an extra €450 million for residential settings is a “kick in the teeth”. The protesters outside Government Buildings told An Taoiseach Enda Kenny, as he made his way into the Cabinet Meeting this morning, that the Government’s announcement that it is to provide a further €450m to nursing homes – effectively residential institutions – is a complete kick in the teeth to the wishes and needs of most people with disabilities and their families. After a cold first night of their gruelling 72-hour campaign on Merrion Street, the initial group of 20 campaigners are expecting an even bigger number of people to join them today. They are planning a press conference outside Government Buildings at 12 pm today to talk further about their demands for equality and human rights as equal citizens. This starts, they said, with listening to people with disabilities and with recognising their expectations to be able to live independently where possible. Naughton, along with other activists, made the decision to take the streets following appalling and alarming reports about the treatment of people, mainly with disabilities, at some residential centres. The group remains hopeful that An Taoiseach’s commitment to meet with them, made yesterday, will be confirmed today. The group will set out to Mr Kenny and his Ministers how state funding for people with disabilities can be much more efficiently and effectively used by reallocating resources away from the outdated current model which pays institutions to provide services to people to models which would mean that people with disabilities can choose and pay for the supports and services they need themselves if they so wish. For more information, please contact Martin Naughton (086 820 7196) or Edel Hackett (087 293 5207).